All along Sydney's eastern shore and around Sydney Harbour, Sydney's beaches provide day-out pleasures in swimming, surfing, or simply lazing away the day on brilliant white sand or in adjacent parkland. Avalon Beach lies between two headlands in Sydney's Northern Beaches region just east of, and a short walk from, Barrenjoey Rd. The main beach is patrolled by surf lifesavers. With a well-formed right break, the beach is an attraction for surfers. At the southern end of the beach is a large saltwater pool which provides a protected environment for adults and children alike who prefer to swim in calmer waters. The beach is an hour's drive from the Sydney city centre. By bus takes at least a quarter hour more. Balmoral Beach in Sydney's Middle Harbour lies just west of Middle Head, a picturesque crescent-shaped beach with its own island — Rocky Point. In summer, the Balmoral Rotunda is the place to experience Shakespeare by the Sea. The rotunda and rocky Point Island are popular for weddings and photographs. Restaurants and cafes are at beachside. The Bathers Pavilion, a 1928 Spanish-Moorish-style building, is noted for its restaurant serving modern Australian cuisine. Aside from off-street parking, there's a dedicated parking area at the southern end of the beach. Parking fees apply. There is an area of enclosed public baths by Balmoral Wharf and and just north of Rocky Point Island is a netted shark-proof pool. Picnic and barbecue facilities are available. The beach is not patrolled by surf lifesavers. Arguably Sydney's best-known beach, Bondi lies roughly southeast of the Sydney city centre and is accessible by bus from the city or by train to Bondi Junction and then by bus to the beach. While there are dedicated parking areas by the beach (parking charges apply) and there's metered parking along the streets, driving can sometimes be a hassle and most beachgoers travel by public transport. Bus 380 from Circular Quay should bring you to Bondi Beach in about 40 minutes. If taking the train from the city, the connecting bus from Bondi Junction should get you to the beach in 15 minutes or so. Beachside Campbell Pde is a row of restaurants and cafes and can be thronged with beachgoers. Less crowded places are to be found off Campbell Pde away from the beach. The Bondi Surf Lifesaving Pavilion has a cafe, art gallery and an al fresco performance space. The Bondi Icebergs Club at the southern end of the beach has cafes, a fine restaurant, and the adjoining Bondi Baths. If you were driving from North Sydney to Manly you'd be taking Military Rd until Spit Junction in the suburb of Mosman, then turning into Spit Rd which brings you to The Spit and The Spit Bridge. The Spit Bridge is an opening bridge and is closed to road traffic a number of times daily when the bridge opens to allow ships to pass unhindered through that section of Sydney's Middle Harbour. Almost directly east of The Spit is the suburb of Clontarf where you'll find long and narrow Clontarf Beach with playground and barbecue facilities, a pool, and a marina. Driving to Clontarf Beach from The Spit is a little tricky as you turn west to get east. Cross The Spit Bridge north and up the hill, turning left (west) where it says Clontarf/Frenchs Forest. At the roundabout do a sharp left (east) into Ethel St, then right into Kanangra Cres. Turn left into Perrone Rd, then sharp right into Sandy Bay Rd and — how about that? — you're there. Like its more famous eastern Sydney beach, Bondi, Coogee Beach faces the Pacific. It's a smaller, cosier beach with baths at its northern end and the Ross Jones Memorial Pool at the southern end adjacent to the Coogee Surf Lifesaving Club. The beach is patrolled by beach inspectors and surf lifeguards in summer and winter. Metered street parking is available but for those who prefer public transport, bus services 372, 373 and 374 from the city Sydney city centre terminate at Coogee Beach. Beachside or a short walk away are hotels, cafes, restaurants and parklands. The unbroken stretch of Cronulla beaches lies along a long golden arc facing Bate Bay from Cronulla Point in the south to Kurnell Peninsula in the northeast. They are favorite places for surfing, body boarding and, in protected sections, swimming. Cronulla Beach (sometimes referred to as South Cronulla Beach to differentiate it from its northern neighbor) is the closest to Cronulla train station which is on the other side of the Cronula peninsula. Walk east from Cronulla station through Beach Park into Cronulla Park and into Cronulla Beach. Cronulla Beach is a relatively small beach but it adjoins a carpark and is close to restaurants and cafes. A short walk north, past a rocky outcrop with two rock pools, is North Cronulla Beach adjoining Dunningham Park and a pedestrian mall with a variety of restaurants alongside it. The beach then stretches north in that arc of golden sand all the way to Kurnell Peninsula. Along the way are Elouera Beach and Wanda Beach. You only notice they are differently named beaches by the surf lifeaving clubhouses there. Cronulla, North Cronulla, Elouera and Wanda surf lifesavers patrol the beaches as well as observe beach activity from lookout towers. Swimmers are advised to always swim between the flags for safety. South of Cronulla Point are the tiny isolated beaches of Blackwoods and Shelly. Shelly Beach and Glaisher Point south of Shelly Beach have rock pools for those who like swimming in a protected environment. There are beachside walkways all the way from Wanda Beach south to Glaisher Point, then around Bass and Flinders Point to Hungry Point at the southwest end of the Cronulla peninsula. For those who drive, there's parking west of Cronulla Park, west and north of Dunningham Park, west of Wanda Beach and all along the beachside roads. 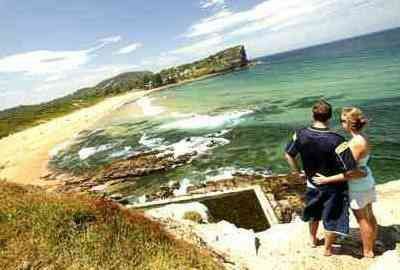 Nestled between two headlands, Freshwater Beach is the first beach north of Manly in Sydney's Northern Beaches region. It is the place where official surfboard riding began in the early 1900s when Hawaiian swimmer, surfer and Olympic champion Duke Kahanamoku demonstrated his board riding skills to thousands of spectators. You can deduce from this that relatively small Freshwater Beach, just about 350m long, is one of Sydney's popular surfing beaches and the site of a number of national surfing competitions. The beach receives waves averaging 1.6m, producing rips against each headland and in the centre section. This makes for good surfing conditions but can be hazardous for swimmers. If out for a swim, be sure to remain between the flags or stay in the rock pool at the beach's northern end. The beach has good access, with space for parking, and adjoins a reserve with playground and barbecue facilities. Flanked by Bundeen Reserve and Bundeena Wharf in the east and Cabbage Tree Point Reserve in the northwest, Horderns Beach is a narrow, 700m-long, sandy beach in Bundeena Bay on the eastern edge of Royal National Park. Bundeena is not part of Royal National Park and if you were driving and merely passing through to Bundeena without stopping within the national park, you would not need to pay an entry fee at the gate to the national park. Just say you're going to Bundeena. Another way of reaching Bundeena is by ferry from Cronulla across Port Hacking. The ferry wharf at Cronulla lies just west of Cronulla train station. Horderns Beach backs into Bundeena township, and across the wharf to the east lies two other Bundeena beaches &mash; Gunyah and Jibbon. Bundeena is said to take its name from an Aboriginal word meaning "noise like thunder" and traces of the original inhabitants, the Dharawal people, are to be seen in rock carvings and middens (seafood shell piles). Long Reef Beach, in Dee Why in the Northern Beaches region, is a continuation of Dee Why Beach which lies between Dee Why Lagoon and the Tasman Sea. The Long Reef Aquatic Reserve starts at the northern end of Long Reef Beach. The Dee Why beaches feature good waves for surfing but rips can prove hazardous to swimmers. Because of its accessibility by car via Pittwater Rd — and with good parking, park and picnic facilities — the Dee Why beaches are a drawcard for visitors. Those out for a swim are advised to remain between the flags. If you take the ferry from Circular Quay to Manly, you'd alight at Manly Wharf in Manly Cove on the Sydney Harbour side. You'd then need to walk northeast through The Corso to reach pine-fringed Manly Beach, which is also called South Steyne Beach, on the Pacific side. Manly Beach, home to beach volleyball, surf competitions and festivals such as the International Jazz Festival and the Food and Wine Festival, is a most popular tourist destination, with rows of restaurants, cafes and shops, coupled with easy accessibllity by harbour ferry. It is the Sydney gateway to the city's Northern Beaches region. Manly Beach leads northward in a slow sandy arch to North Steyne Beach, where men in boradshorts and women in bikinis take to the long strip of sand to take advantage of the sun when the weather's good. There are rock pools at either end of the Manly/North Steyne strip for those who prefer calmer, protected waters when taking a dip in the sea. Parking is available. Charges apply. North Narrabeen Beach is the northernmost beach on the Narrabeen Peninsula close to the junction of Pittwater Rd and Wakehurst Parkway. The peninsula is flanked on the east by the ocean and on the west by Narrabeen Lakes. Southward from North Narrabeen Beach is that long stretch of sand comprising Narrabeen and Collaroy Beaches and, across Long Reef Golf Club, Long Reef and Dee Why Beaches. North Narrabeen Beach is protected from northeasterly winds and the lagoon emptying into the ocean at the beach's northern end provides sand banks for surfers. A number of surfing competitions are held on the beach throughout the year, including the rich Coke Classic in April. North Narrabeen and Narrabeen Beaches are patrolled in the summer months. North Narrabeen Beach backs into Birdwood Park with parking, playground and picnic facilities at the northern end. Palm Beach is both Sydney suburb and beach. Palm Beach the suburb is hemmed in by Broken Bay in the north; the Tasman Sea, within the Pacific Ocean, in the east; Whale Beach, Avalon and Clareville in the south; and Pittwater in the west. Palm Beach the beach fronts the Tasman Sea and curves northward from Cabbage Tree Boat Harbour to Barrenjoey Headland with its lighthouse built in 1881. The beach is Sydney's northernmost beach along the Pacific coast. The usual road route to Palm Beach from Sydney city centre is across Sydney Harbour by bridge or tunnel, then northeast on Military Rd past the Spit Bridge toward Manly, then turning north on Pittwater Rd, thence into Barrenjoey Rd all the way to Palm Beach and Beach Rd. The beach in Nielsen Park, part of Sydney Harbour National Park, faces Shark Bay in the east Sydney suburb of Vaucluse. Because of its location, the beach is properly known as Shark Beach but is popularly known simply as Nielsen Park. When I still lived in the outskirts of Sydney city centre, Nielsen Park was one of my favorite Sydney beach destinations, being easy to drive to through William St past Kings Cross and into New South Head Rd, turning left into Vaucluse Rd after Kambala Anglican Girls School. I'd then turn left into Greycliffe Ave almost at the end of Vaucluse Rd, park, and walk to the beach. Nielsen Park is well known for its shady grounds and shark net-protected beach. At the start of the annual Sydney Hobart Yacht Race, Nielsen Park is one of the best vantage points for viewing the yachts as they sailed through to South Head before turning south in the South Pacific Ocean towards Tasmania.